The royal throne of heroic Iberia counts thee, Hermenegild, as one of its glories: so, too, do the Martyrs, whose love of Christ has numbered them among the Blessed of heaven. Thy father's promises could not seduce thee. The luxuries of a life of ease and wealth, the glitter of diamonds, the prospect of a throne,—they could not allure thee. Thou wast not affrighted by the threat of a cruel death, or by the executioner's merciless rage; for the everlasting joys of heaven were dearer to thee than those of time. O God, by whose holy Spirit blessed Hermenegildus, thy Martyr, was taught to despise an earthly crown for an eternal one; grant, we beseech thee, that, by his example, we may learn to contemn the things of this world, and fix our hearts on those more valuable goods of the next. Through our Lord Jesus Christ, thy Son, who liveth and reigneth with thee, in the unity of the Holy Ghost, God, world without end. Amen. It is through a Martyr's palm-branch that we must to-day see the Paschal Mystery. Hermenegild, a young Visigoth Prince, is put to death by his heretical father, because he courageously refused to receive his Easter Communion from an Arian Bishop. The Martyr knew that the Eucharist is the sacred symbol of Catholic unity; and that we are not allowed to approach the Holy Table in company with them that are not in the true Church. A sacrilegious consecration gives heretics the real possession of the Divine Mystery, if the priestly character be in him who dares to offer Sacrifice to the God whom he blasphemes; but the Catholic, who knows that he may not so much as pray with heretics, shudders at the sight of the profanation, and would rather die than share, by his presence, in insulting our Redeemer in that very Sacrifice and Sacrament, which were instituted that we might all be made one in God. The blood of the Martyr produced its fruit: Spain threw off the chains of heresy that had enslaved her, and a Council, held at Toledo, completed the work of conversion begun by Hermenegild's sacrifice. There are very few instances recorded in history of a whole Nation rising up in a mass to abjure heresy; but Spain did it, for she seems to be a country on which heaven lavishes exceptional blessings. Shortly after this she was put through the ordeal of the Saracen invasion; she triumphed here again by the bravery of her children; and ever since then, her Faith has been so staunch and so pure, as to merit for her the proud title of The Catholic Kingdom. St. Gregory the Great, a contemporary of St. Hermenegild, has transmitted to us the following account of the martyrdom. The Church has inserted it in her Second Lessons of to-day's Matins. King Hermenegild, son of Leovigild king of the Visigoths, was converted, from the Arian heresy, to the Catholic faith, by the preaching of the venerable Leander, Bishop of Seville, one of my oldest and dearest friends. His father, who continued in the Arian heresy, did his utmost, both by promises, and threats, to induce him to apostatise. But Hermenegild returned him ever the same answer, that he never could abandon the true faith, after having once known it. The father, in a fit of displeasure, deprived him not only of his right to the throne, but of everything he possessed. And when even this failed to break the energy of his soul, he had him put into close confinement with chains on his neck and hands. Hereupon the youthful king Hermenegild began to despise the earthly, and ardently to long for the heavenly, kingdom. Thus fettered, and wearing a hairshirt, he besought the Omnipotent God to support him. As to the glory of this fleeting world, he nobly looked on it with disdain, the more so as his captivity taught him the nothingness of that which could thus be taken from him. It was the Feast of Easter. At an early hour of the night, when all was still, his wicked father sent an Arian Bishop to him, with this message, that if he would receive Communion from his hands, (the Communion of a sacrilegious consecration!) he should be restored to favour. True to his Creator, the man of God gave a merited reproof to the Arian Bishop, and, with holy indignation, rejected his sinful offer; for though his body lay prostrate in chains, his soul stood on ground beyond the reach of tyranny. The Bishop therefore, returned whence he had come. The Arian father raged, and straightway sent his lictors, bidding them repair to the prison of the unflinching Confessor of the Lord, and murder him on the spot. They obeyed; they entered the prison; they cleft his skull with a sword; they took away the life of the body, and slew what he, the slain one, had sworn to count as vile. Miracles soon followed, whereby heaven testified to the true glory of Hermenegild; for during, the night, there was heard sweet music nigh to the body of the King and Martyr,—King indeed, because he was a Martyr. It is said that lights were seen at the same time burning in the prison. The Faithful were led, by these signs, to revere the body, as being that of a martyr. As to the wicked father, he repented for having imbrued his hands in his son's blood; but his repentance was not unto salvation, inasmuch as, whilst acknowledging the Catholic Faith to be the true one, he had not the courage to embrace it, for he feared the displeasure of his subjects. When in his last sickness, and at the point of death, he commended his son Reccared, a heretic, to the care of Leander the Bishop, whom he had hitherto persecuted, but from whom he now asked, that he would do for this son what he had, by his exhortations, done for Hermenegild. Having made this request, he died, and was succeeded, on the throne, by Reccared, who taking, not his wicked father, but his martyred brother, as his model, he abandoned the impious Arian heresy, and led the whole Visigoth nation to the true Faith. He would not allow any man to serve in his armies, who dared to continue the enemy of the God of hosts by heresy. Neither is it to be wondered at, that being the brother of a Martyr, he should have become a propagator of the true Faith, for it was by Hermenegild's merits that he has succeeded in reconciling so many thousands to the great God of heaven. Levigild, or Leovigild, the Goth, king of Spain, had two sons by his first wife Theodosia, namely, Hermenegild and Recared. These he educated in the Arian heresy, which he himself professed, but married Hermenegild, the eldest, to Ingondes, a zealous Catholic, and daughter to Sigebert, king of Austrasia, in France. The grandees had hitherto disposed of their crown by election, but Levigild, to secure it to his posterity, associated his two sons with him in his sovereignty, and allotted to each a portion of his dominions to inure them to government, and Seville fell to the lot of the elder. Ingondes had much to suffer from Gosvint, a bigoted Arian, whom Levigild had married after the death of Theodosia; but, in spite of all her cruel treatment, she adhered strictly to the Catholic faith. And such was the force of her example, and of the instructions and exhortations of St. Leander, bishop of Seville, that the prince became a convert; and, taking the opportunity of his father's absence, abjured his heresy, and was received into the church by the imposition of hands, and the unction of chrism on the forehead. Levigild, who was already exasperated against his son, upon the first appearance of his change, being now informed of his open profession of the Catholic faith, in a transport of rage divested him of the title of king, and resolved to deprive him of his possessions, his princess, and even his life, unless he returned to his former sentiments. Hermenegild, looking upon himself as a sovereign prince, resolved to stand upon his defence, and was supported by all the Catholics in Spain; but they were by much too weak to defend him against the Arians. The prince therefore sent St. Leander to Constantinople, to solicit Tiberius for succours. But he dying soon after, and his successor Maurice being obliged to employ all his forces to defend his own dominions against the Persians, who had made many irruptions into the imperial territories, no succours were to be obtained. Hermenegild implored next the assistance of the Roman generals, who were with a small army in that part of Spain, on the coast of the Mediterranean, of which the empire of Constantinople still retained possession. They engaged themselves by oath to protect him, and received his wife Ingondes and infant son for hostages; but, being corrupted by Levigild's money, they basely betrayed him. Levigild held his son besieged in Seville above a year, till Hermenegild, no longer able to defend himself in his capital, fled secretly to join the Roman camp; but, being informed of their treachery, he went to Cordova, and thence to Osseto, a very strong place, in which there was a church held in particular veneration over all Spain. He shut himself up in this fortress with three hundred chosen men; but the place was taken and burnt by Levigild. The prince sought a refuge in a church at the foot of the altar; and the Arian king not presuming to violate that sacred place, permitted his second son, Recared, then an Arian, to go to him, and to promise him pardon, in case he submitted himself and asked forgiveness. Hermenegild believed his father sincere, and going out threw himself at his feet. Levigild embraced him, and renewed his fair promises, with a thousand caresses, till he had got him into his own camp. He then ordered him to be stripped of his royal robes, loaded with chains, and conducted prisoner to the tower of Seville, in 586, when the saint had reigned two years, as F. Flores proves from one of his coins, and other monuments. There he again employed all manner of threats and promises to draw him back to his heresy, and hoping to overcome his constancy, caused him to be confined in a most frightful dungeon, and treated with all sorts of cruelty. The martyr repeated always what he had before wrote to his father: “I confess your goodness to me has been extreme. I will preserve to my dying breath the respect, duty, and tenderness which I owe you; but is it possible that you should desire me to prefer worldly greatness to my salvation? I value the crown as nothing; I am ready to lose sceptre and life too, rather than abandon the divine truth.” The prison was to him a school of virtue. He clothed himself in sackcloth, and added other voluntary austerities to the hardships of his confinement, and with fervent prayers begged of God to vouchsafe him the strength and assistance which was necessary to support him in his combat for the truth. The solemnity of Easter being come, the perfidious father sent to him an Arian bishop in the night, offering to take him into favour if he received the communion from the hand of that prelate [the Communion of a sacrilegious consecration]; but Hermenegild rejected the proposal with [holy] indignation, reproaching the messenger with the impiety of his sect, as if he had been at full liberty. The bishop, returning to the Arian king with this account, the furious father, seeing the faith of his son proof against all his endeavours to pervert him, sent soldiers out of hand to dispatch him. They entered the prison, and found the saint fearless and ready to receive the stroke of death, which they instantly inflicted on him, cleaving his head with an axe, whereby his brains were scattered on the floor. St. Gregory the Great attributes to the merits of this martyr the conversion of his brother, King Recared, and of the whole kingdom of the Visigoths in Spain. Levigild was stung with remorse for his crime, and though by God's secret, but just judgment, he was not himself converted, yet, on his death-bed, he recommended his son Recared to St. Leander, desiring him to instruct him in the same manner as he had done his brother Hermenegild — that is, to make him a Catholic. This saint received the crown of martyrdom on Easter-Eve, the 13th of April. His body remains at Seville. St. Gregory of Tours observes, that what-ever guilt this holy king and martyr incured by taking up arms against his father, this at least was expiated by his heroic virtue and death. 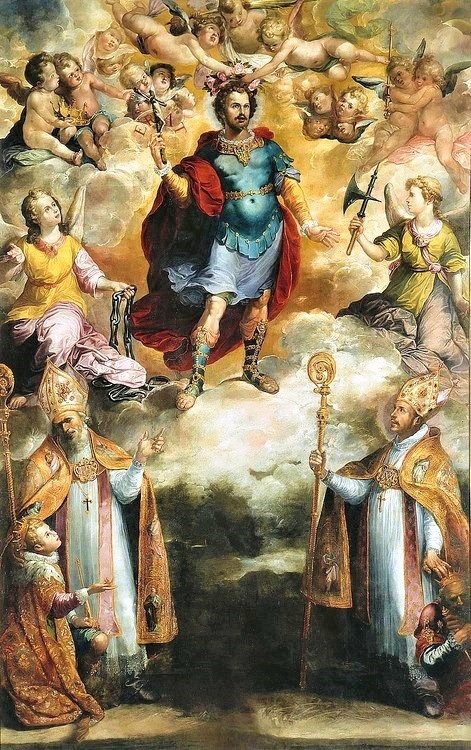 Before St. Hermenegild declared himself a Catholic the persecution was raised with great violence against the Goths, who embraced the orthodox faith of the Trinity, and many lost their goods, many were banished, and several died of hunger, or by violence. St. Gregory of Tours ascribes not only the death of St. Hermenegild, but also this whole persecution, chiefly to the instigation of Gosvint. St. Hermenegild began then to be truly a king, says St. Gregory the Great, when he became a martyr. From his first conversion to the true faith, it was his main study to square his life by the most holy maxims of the gospel. Yet, perhaps whilst he lived amidst the hurry, flatteries, and pomp of a throne, his virtue was for some time imperfect, and his heart was not perfectly crucified to the world. But humiliations and sufferings for Christ, which the saint bore with the heroic courage, the fidelity, and perfect charity of the martyrs, entirely broke all secret ties of his affections to the earth, and rendered him already a martyr in the disposition of his soul, before he attained to that glorious crown. Christ founded all the glory of his humanity and that of his spiritual kingdom, the salvation of the universe, and all the other great designs of his sacred incarnation, upon the meanness of his poor and abject life, and his ignominious sufferings and death. This same conduct he held in his apostles and all his saints. Their highest exaltation in his grace and glory, was built upon their most profound humility, and the most perfect crucifixion of their hearts to the world and themselves; the foundation of which was most frequently laid by the greatest exterior as well as interior humiliations. How sweet, how glorious were the advantages of which, by this means, they became possessed, even in this life! God making their souls his kingdom, and by his grace and holy charity reigning sovereignly in all their affections. Thou hast made us a kingdom to our God, and we shall reign, say all pious souls to Christ, penetrated with gratitude for his inexpressible mercy and goodness, with esteem for his grace and love alone, and with a contempt of all earthly things. They are truly kings, depending on God alone, being in all things, with inexpressible joy, subject to him only, and to all creatures, purely for his sake; enjoying a perfect liberty, despising equally the frowns and the flatteries of the world, ever united to God. The riches of this interior kingdom, which they possess in Christ, are incomprehensible, as St. Paul assures us. They consist in his grace, light, science of divine things, true wisdom, and sublime sentiments of his love and all virtues. In this kingdom, souls are so replenished with the fulness of God, as St. Paul expresses it, that they can desire no other goods. This is to be truly rich. Joy and pleasure are possessed in this kingdom. The solid delight, sweetness, comfort, and peace, which a soul relishes in it, surpass all the heart can desire, or the understanding conceive. Lastly, all worldly splendour is less than a dream or shadow, if compared to the dignity, glory, and honour of this happy state. Thus was St. Hermenegild a great king in his chains. We also are invited to the same kingdom. St. Hermenegild, pray for us.